University of Rhode Island College of Pharmacy | SIGNET Electronic Systems, Inc. 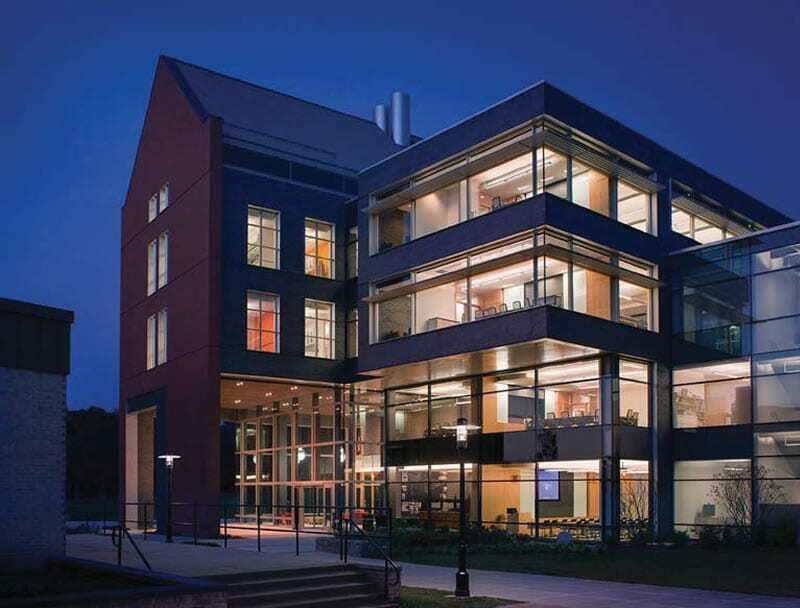 In 2009, the University of Rhode Island set out to replace their aging College of Pharmacy building, built in 1964, with a new, stateof- the-art $75 million complex. The new complex would house the growing 700+ students and faculty while providing hi-tech classrooms, lecture halls and laboratories to pave the way “in training a new generation of pharmacists, growing the state’s research capacity, and generating groundbreaking discoveries,” said Governor Donald L. Carcieri. A top challenge for today’s architects and consultants is future proofing the design of a new building, especially one with a large requirement for highly sophisticated Audio-Visual technical classrooms, not only used for internal, but also external collaboration. Per the University’s request, revisions in the scope of work and design changes were necessary. This would require not only a knowledgeable and fl exible Integration Contractor, but also one that could both assist in the engineering and deploy the cutting edge technology required to future proof the new classrooms for years to come. Working closely with General Contractor, Suff olk Construction, and side by side with College of Pharmacy’s Lead Information Technologist, Ian Lester, SIGNET successfully assisted in the redesign and implementation of the challenging $1 million dollar Integrated Audio Visual and Technology System project. The initial AV designs included aging technologies both in the way of displays, sources and controls for the 10+ hi-tech classrooms, lecture hall, and lobby displays. Through two design updates, in less than 6 months, each classroom was updated to include the latest technology from Crestron, Cisco, Polycom, Epson, NEC and LG. “The SIGNET team has been a real pleasure to work with. They have been highly responsive to our needs and focused on making sure that our complex installation has exceeded our expectations” – Ian Lester, Lead Information Technologist, College of Pharmacy. To meet the requirements in many of the classrooms, SIGNET deployed Crestron Digital Media Presentation Systems integrated with Cisco Video Conferencing Systems, including two HD PTZ cameras and Polycom digital sound processors. Most rooms included an HD Epson projector or Multiple 65” LG LED LCD displays. The pinnacle of the rooms, the hi-tech lecture hall, included two projection screens, an LG LED LCD display, three HD projectors from Sony and Epson. Adding to the complication of the installation, the Epson projectors required a sophisticated mounting solution to support 3-D imaging similar to today’s hi-end movie theaters. The lecture hall also included a Cisco video conferencing system and over 20 hanging microphones for full classroom interaction. Wrapping up the successfully deployed systems, guests are greeted by a Sharp 80” LED interactive display in the lobby entrance. Part of being a successful Systems Integrator is not only providing the project installation with accuracy and on-time completion, but also providing successful service when and if equipment fails. SIGNET is proud to off er a comprehensive Service Department to handle all post-project service needs. SIGNET Electronic Systems, Inc. is proud to off er a full range of professional services including Design, Engineering, Installation, and Service for all of your low voltage system needs in not only AV, but also Security, Tel-Com, Fire Alarm, and Nurse Call.